This is a luxury magazine, reminiscent of the best major tour concert programmes, beautifully printed and in a 12 X 12 inch LP sleeve format. 'Long Live Vinyl' equals specialist fine-art photography journals for production values of this physical object in an era of online reading. Just as the vinyl LP is a unique tangible experience in an age of audio streaming, 'Long Live Vinyl' is a multi-sensory oasis in a universe of screen-scrolling, if bought in its physical form. The 12X12 (305mm X 305MM) format of the first is non-standard for printers and so will contribute as much to costs as the lavish glossy and laminated textures throughout. A tenner seems a fair price to pay for the object, but what of the contents. Presumably the publishers have thrown as much as they can at the first issue, and subsequent issues are available online and on what appears to be standard format paper. Doubting whether it would survive, this review was held over until several issues emerged. The choice of feature article subject matter is perfect for leafing through while enjoying the relevant albums spinning on the turntable. A Roger Dean interview accompanies beatifully reproduced examples of his iconic 1970s LP sleeves for Yes, Budgie and numerous other luminous progsters. However, even in this otherwise escellent feature piece on Roger Dean, the tendency to assume the first few google results are facts, mars the sidebars. An example of poor fact checking is the statement "Focus' Focus-X album, released in 2012 with its distinctive Roger Dean cover, has just been released on vinyl". Funny, 'cos I bought my (signed) vinyl copy in 2012 when it was simultaneously released on all formats. Research by search engine, without proper fact checking leads to repetition of such innacuracies on blogs and forums and we should expect better of paper publishers of premium product. Although this journal content seems superficially embedded in the vinyl zenith of progressive rock, it seems aimed more at the newcomer to vinyl playback in the home. In this it mostly succeeds, employing Andy Price (of MusicTech) to explain the basics. Like many vinyl neophytes, the authors use the new plural vinyls, rather than the traditional collective plural for vinyl LP's; like the xccollective plural for 'sheep' is 'sheep'. "What on eart is the Old Scribe ranting on about now? ", Demand the Plebs' Chorus, stage left, "Is this 'TNT-audio' or 'Farming Today', or is he just on an old pedant's rant about grammar? Check out the Pedant's Corner (below) for more linguistic pedantry. It is curious that the collective term for LP's has become the material from which they're manufactured. In which case 'Vinyls' might be appropriate if they're made from different polyvinyl compounds. In Old Fart City, inhabited by the Old Scribe, the term Vinyl LP's refers to round black discs from which music is reproduced, and Vinyls refer to adhesive decorations or wraps for cars, vans and trucks. Long Live Vinyl containsd many adverts for record shops (hooray) and new releases or vinylophile re-releases. After reaching its nadir in 2007, when only 205,292 vinyl albums were sold in Britain, the format has been steadily rebounding, thanks in part to the popularity of guitar bands, traditionally associated with vinyl, the launch eight years ago of Record Store Day and the dogged determination of independent record shops. In 1991 for most of the planet and 1992 in the U.K., it became almost impossible to buy vinyl, when high-street giants HMV and W. H. Smiths stopped selling vinyl, to force their customers towards more profitable overpriced CD's (£14 for a CD when vinyl was priced at £5-£7 despite higher production costs for vinyl than CD). Internet shopping did not exist, so music lovers would clamber upstairs at Nottingham's Selectadisc or drive 120 miles to Cob Records in Porthmadog to get their fix. 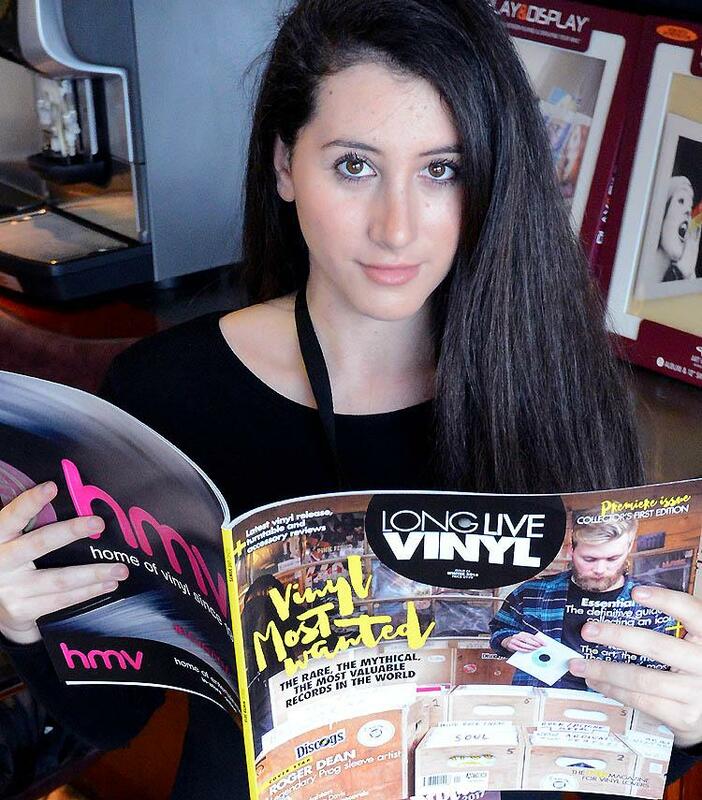 HMV bought a big outside back cover advert on the first issue of 'Long Live Vinyl'. The advert tries to suggesting that HMV are 'the home of vinyl', when in fact they were among the biggest pl;ayers in the original attempt to annihilate vinyl as a music format. 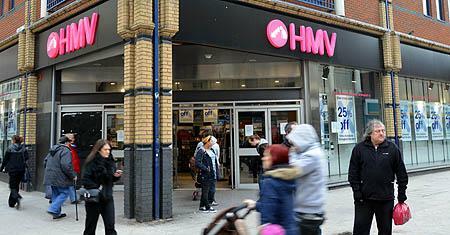 HMV wre a UK national chain responsible for attempting to kill off vinyl in the early 90's. HMV were making no profits from vinyl, which was big, took up more display space and generated little profit per unit sold. At the same time, HMV were generating vast profits from persuading people to replace the music they already owned with the same music stored on a different format. When choosing where to buy music, never forget that HMV put this year's balance sheet above customer service & breadth of consumer choice. Last time there was talk of a vinyl revival, over 10 years ago, HMV made a big deal of stocking an odd selection of a few vinyl titles and PR statements about their "Commitment to vinyl". Your Old Scribe went in to Derby HMV, and made a b-line for the 12" section. To his dismay it was replaced by 'Videos from £5.99'! On asking the bloke who worked there, the response was, "Oh, we got rid of' the vinyl!" Soon that store held its closing down sale. HMV thought they saw a quick buck in the millenial vinyl revival but dropped vinyl again in favour of DVD's and console games. They were early droppers vinyl to force consumers to embrace digital formats, then when this proved to open the door to downloading and free file sharing, HMV (and much of the global entertainment industry) realised that profits were difficult to achieve from music in a digital age. Twice now they've sought to reinvigorate the analogue world they worked so hard to destroy, in a vain hope of sucking some of the profits now seen among the independents. Local independents are enthusiasts committed to what they do, and they pay their taxes too. "When CDs emerged the management thought it was a passing fad", said one independent record retailer. In December 2016 sales (in monetary terms) of vinyl discs exceeded that of digital downloads for the first time since digital downloads became possible. This would have seemed so unlikely 25 years ago, while global entertainment corporations and international retail groups determinedly tried to exterminate the vinyl gramophone record. Many bands, especially those of the jangly indie guitar variety, remained loyal to the format, offering fans limited edition vinyl pre-releases, for example, by U.K. provincial indie and dance labels. This is a rare example of consumers and the maverick small enterprises defeating the big players (record labels and record chainstores), refusing to accept profitable mass mediocrity and demanding diversity of taste and quality. The music lovers' (traders and consumers alike) attachment to vinyl records of splendid individuality is parallel to Italy's slow food movement. The broadsheet Sunday newspaper colour supplements started printing articles on the vinyl revival, and any entrepreneur could spot that people who pay for their recorded music want vinyl, so eventually even the half-wits running HMV are trying to jump back on a bandwagon they'd earlier tried to crash. Going bankrupt was the Karma payback for HMV dropping vinyl and they're being steered to recovery by restructuring specialists Hilco. They had lost their connection with music as much as with vinyl. [use HMV Derby closure] Thats big capitalism for ya. Undermine the independent stores with cheap prices (3 for a tenner) and then stop selling when the independent stores are all closed down and the grass roots demand feed is gone. Local independent record shops have always been the top place to loiter and listen. Magazines and music papers have always been the medium to generate interest to prompt an extra visit to an independent record store. Your Old Scribe popped in to Vinyl Lounge in Mansfield this week, having reserved a new limited edition reissue. Despite being in a 30 minute lunchbreak rush, there was time for flicking through some of the racks and 3 more new LP's and a 12" single joined it in the bag. The many advertisements for independent record stores in 'Long Live Vinyl' are testament to the resurgance of the genre. The inclusion of coffee bars renders that primal activity, loitering in record shops to be a much more civilised activity that the days of a can of coke and a roll-up. The plush production values of 'Loing Live Vinyl' are a metaphor, or even an analogue, for this progress. Long Live Vinyl is another peice in the jigsaw of the return of the vinyl LP record as a premium object of desire. It meets its intended goals and fits the new vinyl market, rather than the charity shop scourers and record fair addicts. The new generation of vinyl junkie wants good coffee and somewhere to sit to sustain their record shop loitering. Propping up the counter, in an unspoken hierarchy of proximity, clutching a baccy tin, went the way of Disc and Record Mirror. Cluching an espresso while perusing the racks is the domain of the Long Live Vinyl reader. Go out of your house/apartment/tent and buy more records NOW! Don't waste time thinking about it. Just buy more stuff to play on your audio system!!! "Here is a sheep" is correct. "Here are some sheep" is equally correct. "Here are some sheeps" is wrong. "Here is a ewe" is also correct. "Here are some ewe" is wrong. "Here are some ewes" is correct. "Here is a vinyl LP" is correct. "Here are some vinyls" is never correct in the context of LP's.